This past Saturday, March 15th was our five year wedding anniversary. We have been planning to do something special for a few weeks now. We had all sorts of ideas. Should we take the train to Paris and drink wine in an outdoor cafe while watching the sun set over the Eiffel Tower. Or maybe we could spend the weekend in Bordeaux and visit some wineries while staying in a cozy bed and breakfast. Or what about going to Barcelona and enjoying the city while exploring something new. Well as tempting as all of these options were to us we ended up deciding on none of them. What did we end up doing? We ended up getting a hamburger 🙂 We know, we know, this is surely the most romantic option of all! I have been asking my students for the last few weeks on good places to go around here to eat. They´ve given me many ideas. The list is long with all types of cuisine from casual to high-end. But sometimes you just want something familiar. So we asked about burgers. 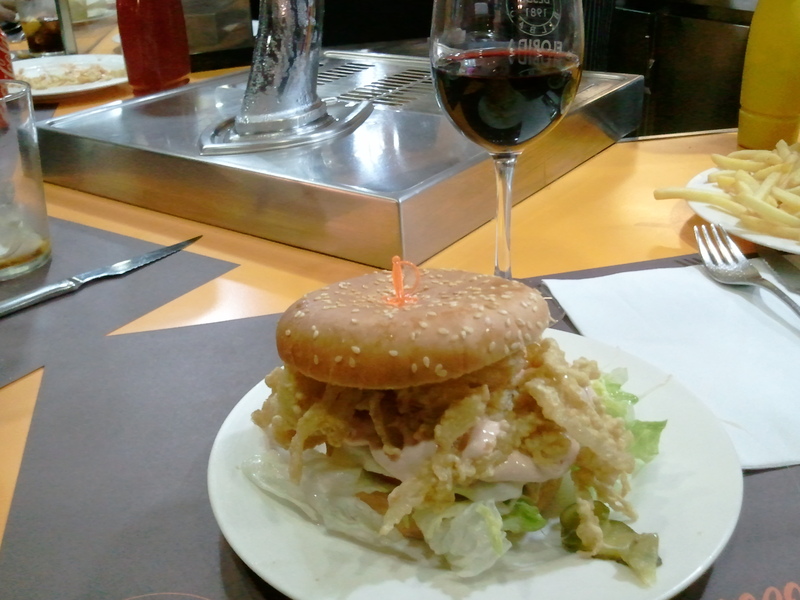 The unanimous recommendation was a place called La Florida near the Gran Via in Bilbao. 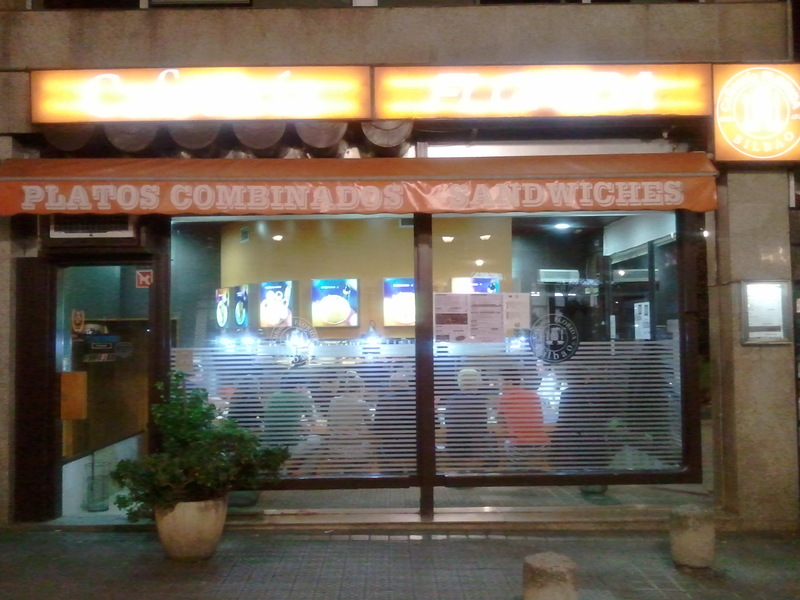 It is a casual restaurant owned by a Spanish person and they specialize in burgers. 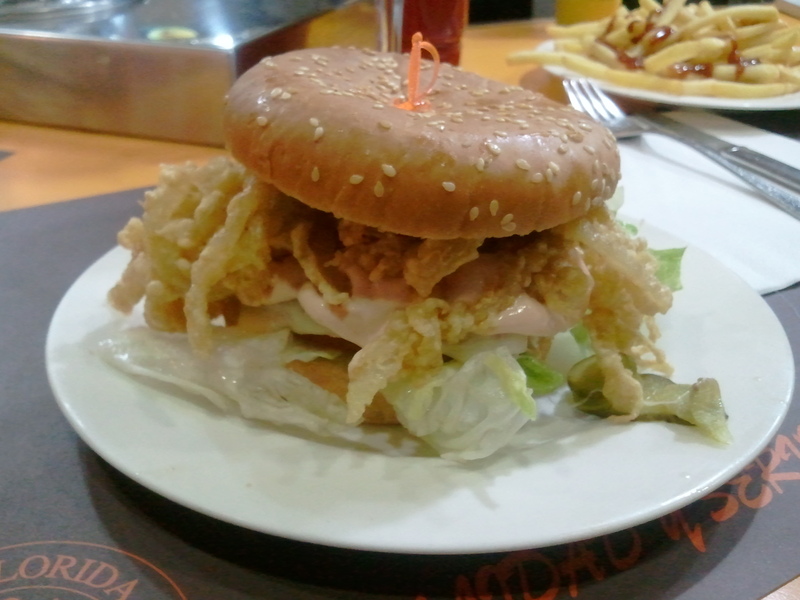 We ordered two burgers ´completo´which means they have fried onions, american salsa, queso, tomato, pepinillo and lechuga. Kanicia got bacon as well with hers and we had fries and a couple of glasses of rioja. La Florida also specializes in tortitas a la plancha which are like pancakes and are served for dessert. We had to try these as well. The place does not have tables but instead it has one large bar which surrounds the kitchen in the middle, similar to Sidebar in Oakland. There was quite a line of people when we arrived at 10pm so that was a good sign. After a short wait we were seated. So what is the verdict? Well, the burgers were good and so was the dessert. They definitely were Spanish influenced but we are in Spain after all. They were not the same as what we might be used to back home at places like Trueburger, Umami or even Super Duper but it was definitely worthwhile. We will be going back for sure. We´re happy that we are able to celebrate our five year anniversary here in Spain while expanding our service to Jehovah. Everything that we’ve experienced here has strengthened our marriage and drawn us closer without a doubt! Thank you for all of the love and nice comments on Instagram! In a few weeks we will be taking a trip to San Sebastian which is the beautiful coastal city and jewel of the Basque Country. That will be the real anniversary celebration. We´ll write about that when it happens and share some pictures. But for now we are content with love and hamburgers. Next PostDo you have any extra Bibles?